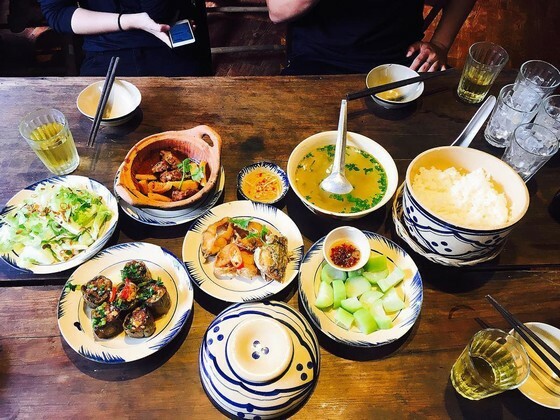 Top 20 delicious dishes of Dalat is the perfect answer for the question “What to eat in Dalat?”. 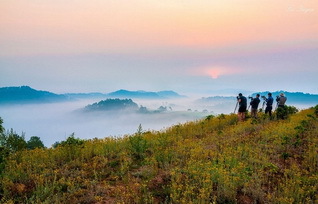 Hopefully this list of famous eating places will help your upcoming Dalat trip. Dalat cuisine is very diverse, and delicious shops are also endless. So for each delicacy I will update the address and evaluate specific delicious shops in a separate article. The climate is cool along with visiting many places that will make rice become a delicious dish at night. Here are some suggestions for lunch and dinner you should think about. 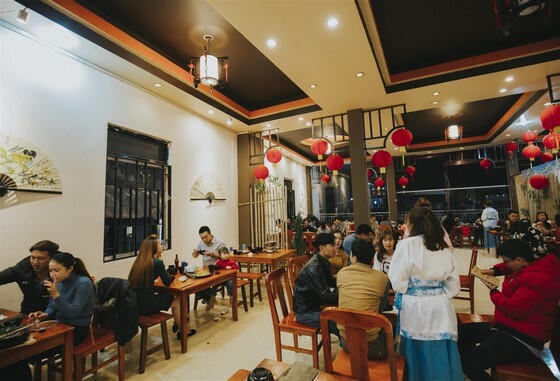 If you want to enjoy good wine and enjoy the spacious and cozy space with affordable prices, go to Tuy Tuu Lau. Just check on Foody, you will understand why it is considered the best barbecue restaurant with friendly staff in Dalat. This restaurant is quite famous, the price is very affordable. Delicious marinated meat, good vegetables, fresh and clean salad are the advantages of the restaurant. Like other hot dishes, porridge is very good for the body when coming to cold land in Dalat. 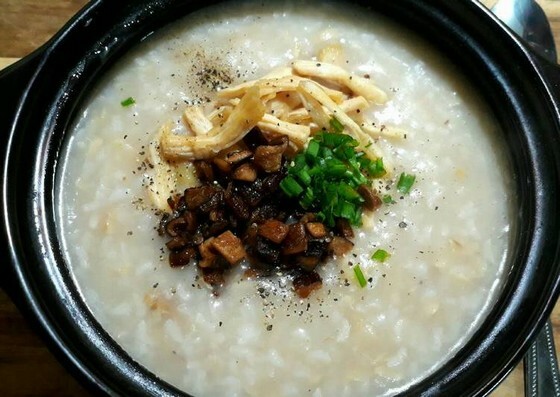 A hot bowl of porridge will help you warm up and dispel the hunger late at night while walking on the street. Frog porridge here is delicious, sweet and charming. A great choice for rainy days. 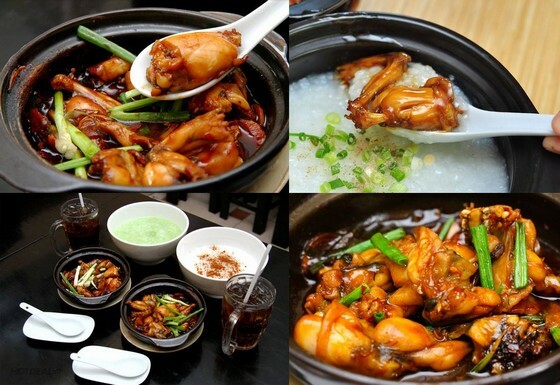 A set of frog porridge costs 38,000 VND including 1 bowl of white porridge and 1 bowl of frog (1 frog). In addition to frog porridge, the shop has many other interesting dishes, the evening is quite crowded so please call to book table in advance 0918118004/0913826768. Located on the sidewalk of Phan Boi Chau Street, chicken porridge here is very delicious and the shop is crowded. In the chilly weather of the foggy city, it is great to have a hot dish of beef hotpot. So the suggestion of eating in Dalat cannot ignore this typical dish. Ba Toa Quan Go beef hotpot has been extremely famous for a long time, so there is no need for further introduction. In addition to beef hotpot, this place also serve dishes such as beef salad, steamed beef stomach…. Beef hotpot here is also very delicious and well known. This shop is not as crowded as Quan Go, the price here is very reasonable. Just as delicious as beef hotpot Ba Toa is beef hotpot Hanh in Ward 2. 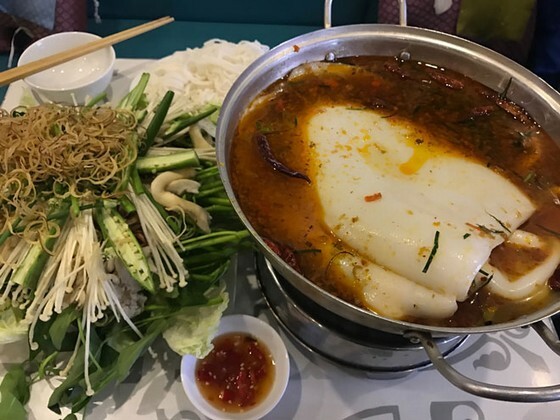 Hanh beef hotpot serves many other dishes such as fried rice, steamed beef…. The shop is located at 5, Ba Thang Tu Street. The restaurant only serves famous chicken hotpot and according to me, it deserves 9 points for quality. This delicious, nutritious and cheap dish is reminded a lot in the suggestions about the place to eat in Dalat. Thai hotpot at Khap Bun Kha restaurant is very delicious, especially each hotpot has a big squid, it is craving. “Another representative” is suitable for the weather in Dalat. Dalat steamed rice rolls with chicken is a dish of Dalat cuisine quite strange and often sold in the evening. 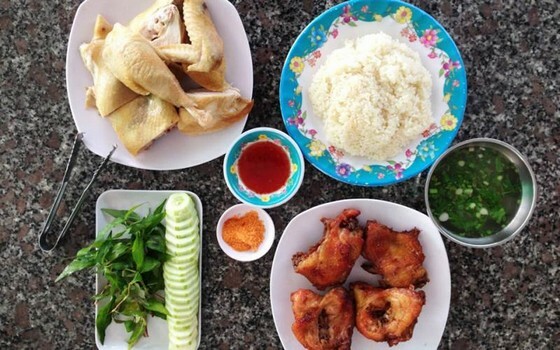 Above are the eateries that are delicious and quite famous in selling Dalat steamed rice rolls with chicken. You can search the place’s name or address on Google maps. Dalat steamed rice rolls with chicken eatery. From Hoa Binh area near Dalat market turns into Truong Cong Dinh alley (only sold from 14:00 pm to 19:00 pm, this shop make very delicious fish sauce, strange food costs 27.000 VND / bowl. Big plate of chicken salad about 4 people eats with price 80.000 VND is considered reasonable. 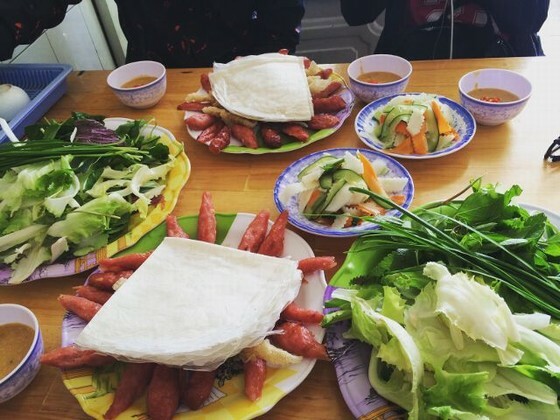 What to eat in Dalat – this is a place in Dalat to eat that you should not ignore. The restaurant is located near Dalat University. Very delicious, the sauce is great, the food is especially cheap and I think it is better than Trang restaurant, the price is only 25.000 VND / bowl. This place sells from 14:00 pm to 18:00 pm, the restaurant is quite delicious but a bit small and if you come late, you have to wait for a table. Quang style noodle here are probably the best in Dalat. The delicious noodles with clean vegetables are the main attraction with tourists. Price range 25.000 VND / bowl. According to my assessment, the price is quite high but quite delicious; there are boiled chicken, fried chicken, roasted chicken, and chicken heart of 25,000 VND/set. Right opposite Tung Nghia bus station, rice is delicious and the price is quite cheap compared to Dai The. The eatery of La Chuoi Rice is at 9/21 Tran Phu, Ward 3. 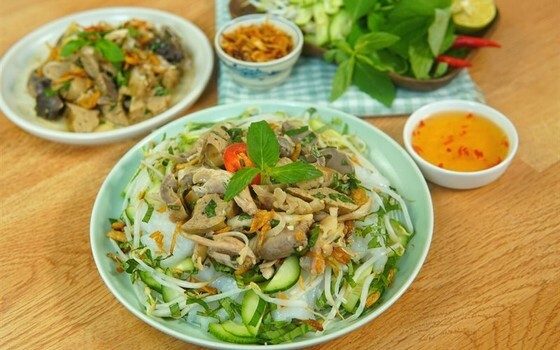 It is consistent with many delicious Vietnamese rustic dishes. The menu changes daily with 3 main dishes, 1 stir fry, 1 soup, and 1 dessert. The shop sells in set menu, the price is reasonable at about 30,000 – 50,000 VND / person. One of the delicious dishes in Dalat that tourists cannot ignore for snacks is grilled meat rolls. Grilled meat rolls in Dalat are very different and the sauce is better than other places. This shop is sure many people have heard about it before going to Dalat – 254 Phan Dinh Phung street. At this restaurant, there is a price of 40,000 VND/set, a set of 2 people is 80,000 VND, ensuring delicious and full. The restaurant is opposite Don Bossco Church – 4 Bui Thi Xuan street (This restaurant is quite delicious, the sauce is delicious but slightly expensive, 1 set 40,000 VND but there is few pork rolls, one set for 2 people is 80,000 VND, it is not enough to be full, but it is considered quite tasty. Located at 01 Chi Lang street, people said this shop has been present here for a long time, and this is the original place of grilled meat rolls in Dalat. 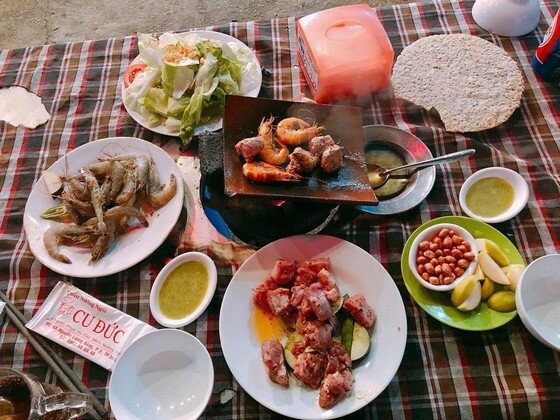 (This shop has a set of 30,000 VND, a set of 50,000 VND for 2 people with reasonable price but very delicious, it is not inferior to other restaurants). If you look for a review of fruit ice cream shops on YouTube, you’ll see lots of good videos. I would like to suggest the shops below and will update a detailed post as soon as possible. Address: 4H Ba Trieu, Dalat city, Lam Dong. This shop has a lot of famous people visit and try. When I ate here, I saw Mr. Pho and his girlfriend also ate here. This area has 2 shops close together and both shops are delicious. This restaurant is so crowded that the door is no longer “small open” anymore. This shop divided into 2 menus: hot sweet soup and cold sweet soup. Here there are many types of hot and cheap (6,000 VND) sweet soups such as: white bean sweet soup, corn sweet soup, thung sweet soup, xoi nuoc sweet soup, hyacinth sweet soup … Cold sweet soup (12.000 VND) as a mixed sweet soup is quite delicious. The shop is located in the center of the city but it will be difficult to find, it must be paid attention. Snail stuffed with meat is a special feature of the thousand-flower city’s cuisine, a delicious dish not to be missed. 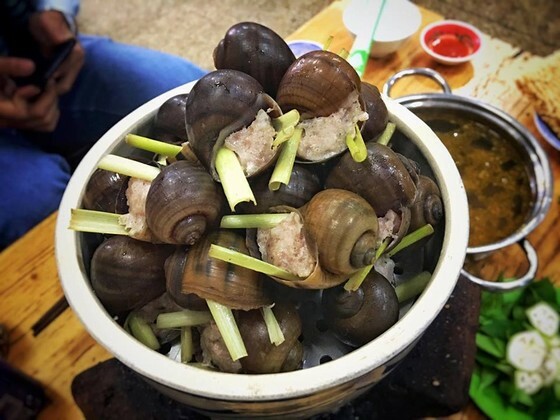 The famous snail stuffed meat restaurant is very famous in Dalat tourist review communities; it must be in the top 10 delicious restaurants in Dalat. 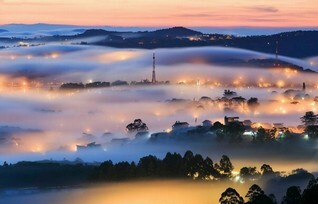 Evening, you can walk around Dalat market or Xuan Huong Lake; you are really hungry and cold. Then this is a delicious, cheap and favorite night food of Dalat people. Perhaps this is the most famous and crowded eatery. The eatery is located on 2 sides of an alley, 50m from Dalat market. Mrs. Hoa only sells this delicious food from 5:00 pm until late at night. Soy milk here is also very delicious. 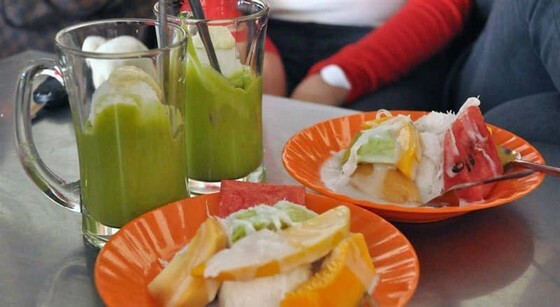 Especially, it has yoghurt with delicious and thick cheese, moderately acidic taste of Dalat. 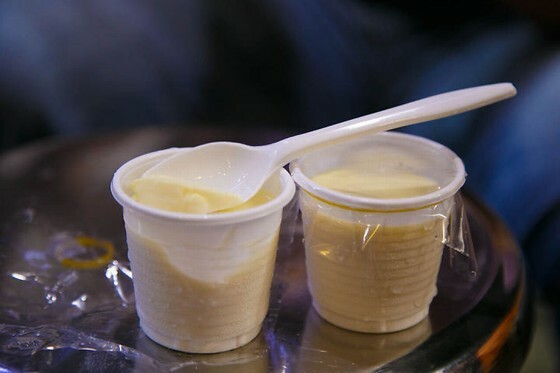 In Dalat, cheese yogurt is a delicious and very familiar dessert. It sells mostly at ice cream shops and other eateries. It is very suitable for girls who like to keep the beauty when traveling. In addition, cheese yogurt is served with boiled chicken egg. Address: 50 Mimosa, ward 10, next to Thien Vuong Co Sat Pagoda. The famous place has delicious cheese yogurt, prices are very cheap. Only a little far from the city center, anyone going to visit Chinese Pagoda, remember to try Cheese Yogurt in this shop. 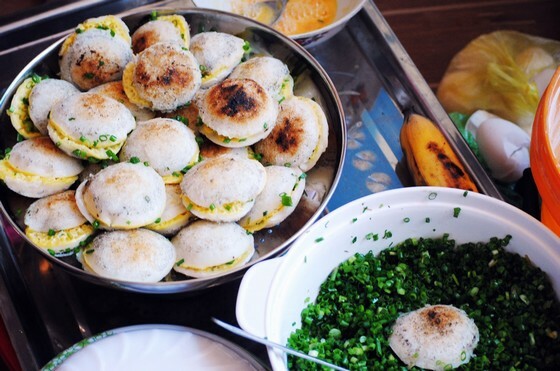 Referring to the delicious dishes in Dalat, it is impossible not to mention the grilled girdle cake. This dish is so famous that people have given it another name, Dalat pizza. Grilled girdle cake here is extremely delicious; you should visit to try this with price from 8,000 VND to 10,000 VND depending on your choice. With the “crazy” character of the shopkeeper, this shop also has another unique name that is grilled girdle cake “Ba Khung”. This eatery’s food is quite delicious, the price is reasonable and the taste is rich. You eat grilled girdle cake in this eatery better than at night market. 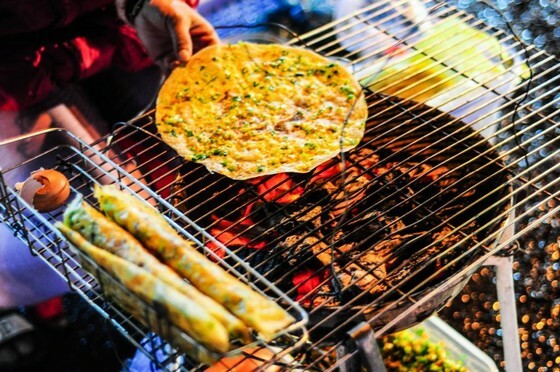 Vietnamese street food vendor grill baked girdle cake- one of eating street, people at outdoor market in cold night- lifestyle of young person in Dalat. This eatery is also quite popular on the internet, which is spread by tourist. Price is reasonable.Many local people have eaten here. The menu is rich and attractive with lots of options for you.Especially teenagers like this dish very much. 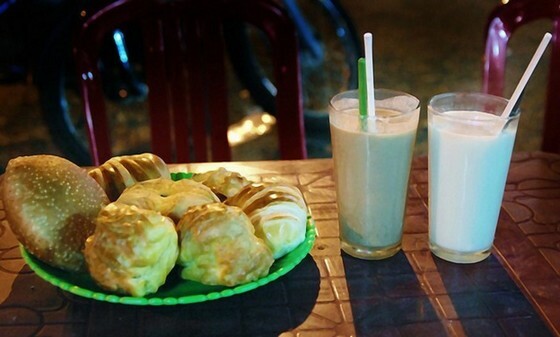 A lot of people are wondering, what should they eat in Dalat for breakfast? It is hard to answer the question: what to eat in Dalat in the morning. 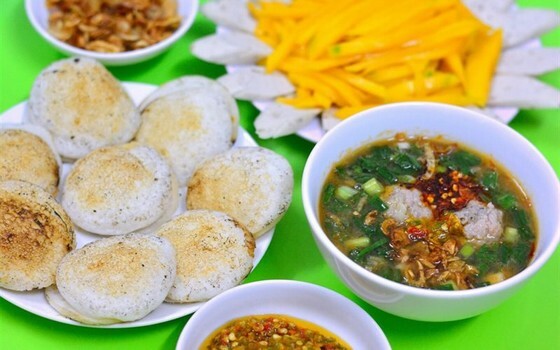 Dalat Trip would like to introduce the top 10 breakfast items below for tourists to choose by themselves. 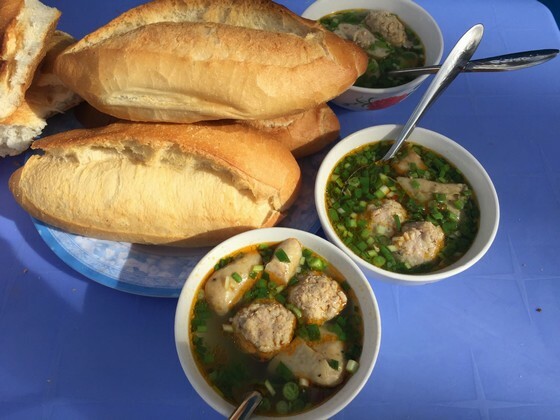 When it comes to delicious food in Dalat, it is impossible not to mention the delicious Vietnamese baguette with meat balls. Hoang Dieu baguette with meat balls, a choice that always satisfy customers. This eatery is quite delicious, crowded and run out of food soon so you should come here early. Only 12,000 VND / bowl with meat balls, pork skin, delicious Vietnamese pork ham and broth. The baguette is served with hot bread. Lien Hoa bakery is very famous in Dalat. There are countless delicious baguettes for you to choose from the menu. This is a delicious and nutritious dish for breakfast. You can see hot pan with egg, beef and fresh vegetables. Along with the meat balls and hot baguette, there’s really good thing to enjoy. Bloating fern-shaped cake No. 4 BaHuong is at 402 PhanĐìnhPhùng. The eatery is quite famous, delicious and the price is also quite reasonable 30,000 VND / set, Vietnamese pork ham with cinnamon flavor is 5,000 VND / piece. Although this place is slightly more expensive than other Can cake eatery, this cake shop is considered as one of the options for your breakfast in Dalat. Can cake is dipped with fish sauce with some sliced carrots. 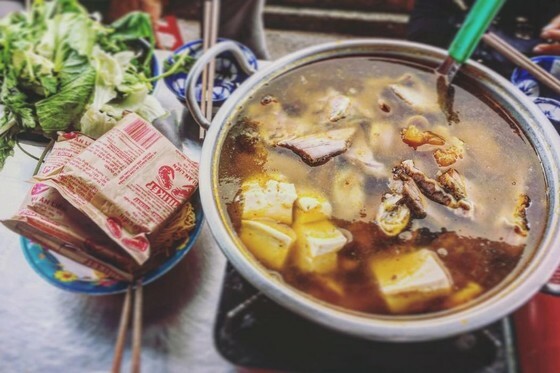 Hue-style beef noodle is considered as the most popular breakfast dish in Dalat. 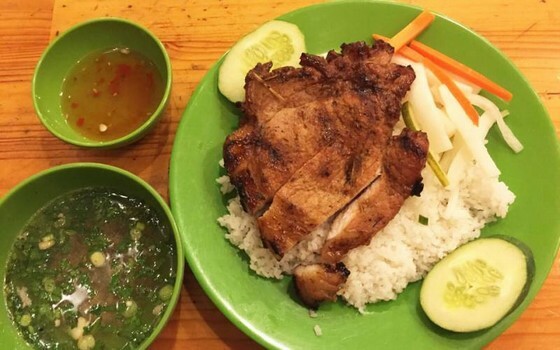 One of the top 20 delicious dishes in Dalat cannot be ignored. The dish of Hue-style beef noodle here is quite delicious from 25,000 VND to 35,000 VND / bowl. The shopkeeper is a Hue person, so the dish is also flavored with Hue style. 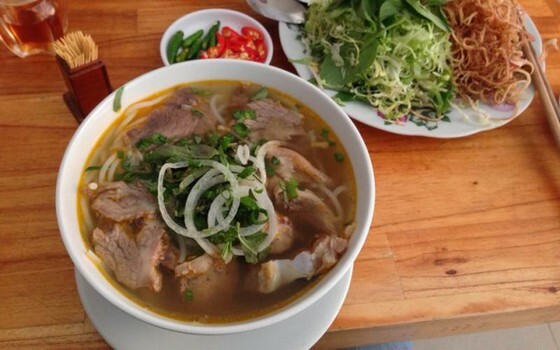 This is a delicious and hot restaurant for breakfast in Dalat, especially Hue-style beef noodle that is very delicious from 35,000 VND to 50,000 VND / bowl. The eatery is beautiful, clean and airy. 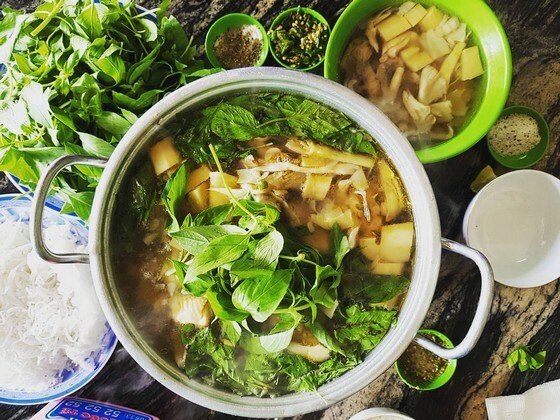 Famous for a long time with Pho, the price is quite reasonable and the taste is also quite good.Vietnamese rice noodle soup is one of very famous local specialty in Vietnam that you must try in your Vietnam holiday package. 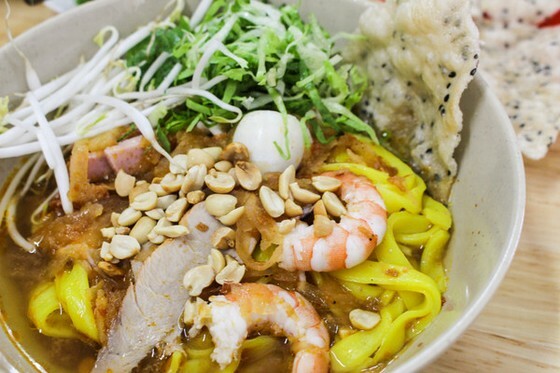 Above is the list of top 20 delicious dishes that you should try in Dalat. Hopefully the above suggestions will help you have a good choice and a delicious meal.